We at CheapScholar.org understand the budgetary challenges that you(as a parent) face when trying to provide the best educational experience possible for your children. Our hope is that through the use of CheapScholar.org we are able to take the guesswork out of the financial aspect of this journey and arm you with the information and tools required to help your student achieve their educational goals. We are here to help! CheapScholar.org can provide you with the financial tools, resources, and knowledge that will assist in the pursuit of a college education for your student. Have questions? Search our website for answers to the most common questions and contact us directly for answers to the not-so-common questions.We always enjoy hearing from our families. Are you a seasoned parent when it comes to sending your children to college? CheapScholar.org is the perfect arena to put your knowledge and experience to good use in assisting other parents that are just getting started. Your input and feedback on topics and questions will be immensely helpful to families and students. 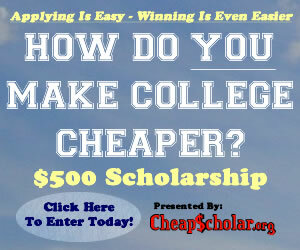 Spread the word about CheapScholar.org to anyone that you feel may benefit from what we have to offer.